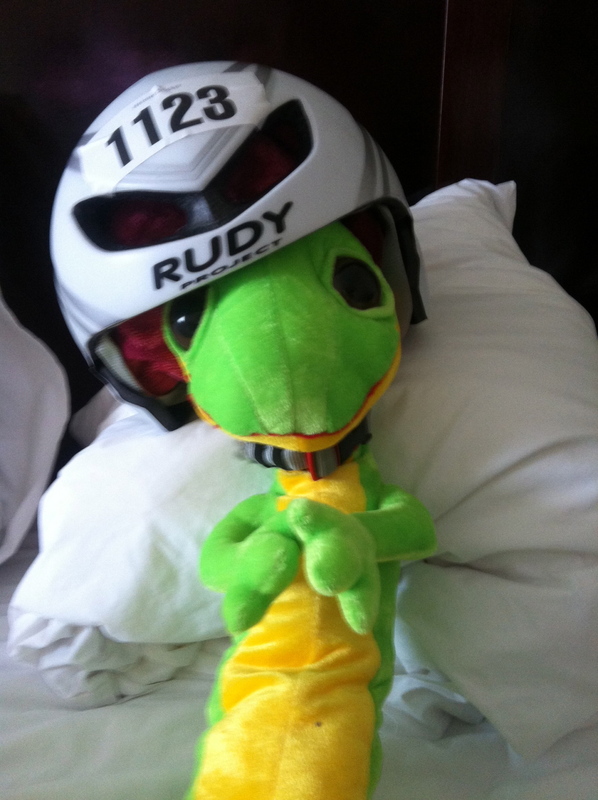 Race week started for me on Wednesday as I headed to Texas and met up with my QT2 Systems partners in crime. 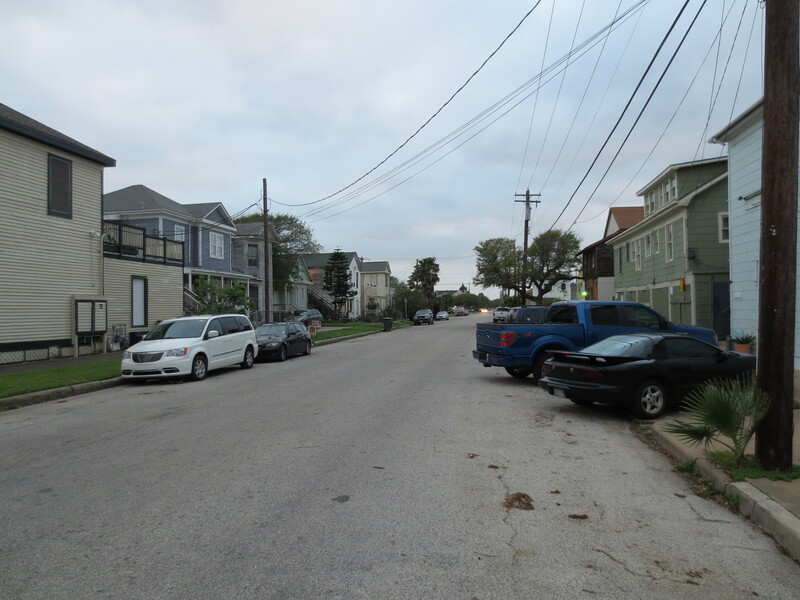 We found our house (in the posh section of Galveston) and settled in. As for the race things went well. The more I race and the more experience I get the less detailed my race plan is. I know that I have to swim as hard as I can, bike very strong – monitoring mostly by HR and perceived exertion, followed by a solid run. The more I race the more it becomes by feel, especially at the 70.3 distance where the level of competition really requires as my buddy Pat Wheeler says “full gas all day”. The Swim begins with a quick jump in the water and some treading before each wave gets the go-ahead. The swim was pretty uneventful as usual. I started out strong and for the first time, due to my improvement in swimming over the winter I was not being overwhelmed by those behind me. I was able to get a good position in front and began to work. 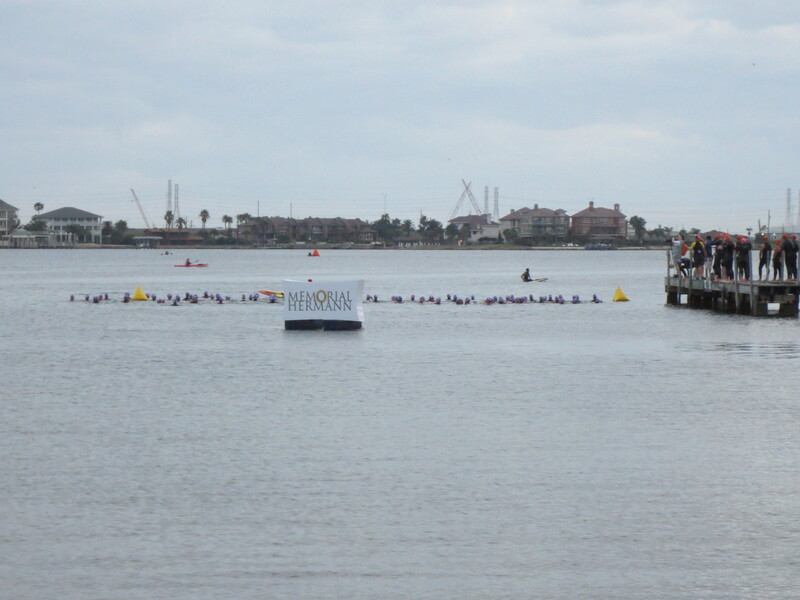 At the first turn buoy you make a left and essentially swim straight for a little less than a mile. It was here that for the first time I was able to utilize swimmers ahead of me as a slingshot as I drafted off them and eventually went by them as I gapped up to the next group. I did this for the remainder of the swim and exited with a 29 minute swim, a best effort for me. 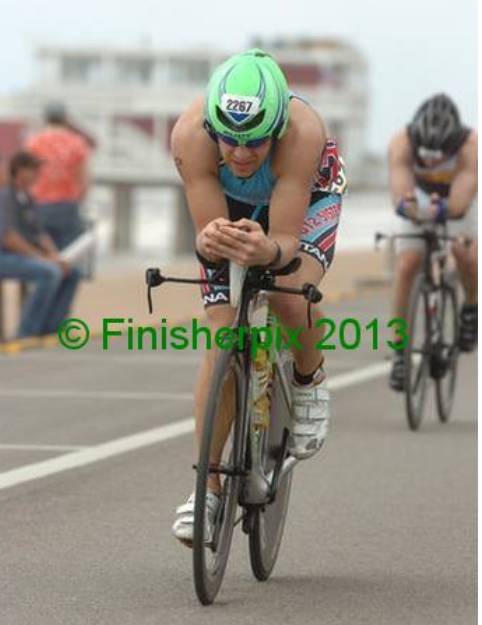 Transition was super long and felt like a full on sprint. On the homestretch back to Transition. The bike course if a flat out and back and the crosswind yielded a consistent effort each way. Once I got on the bike I immediately felt a huge cramp along my right calf towards the top. This freaked me out as I’ve never had this happen before, I knew that if the pain was real that I wouldn’t be able to finish the bike. But first I had to figure out if it was just a cramp or if I had hurt myself from the long transition run. After some fancy stretching over the first 5-10 miles the pain subsided and I was able to keep things rolling steady. 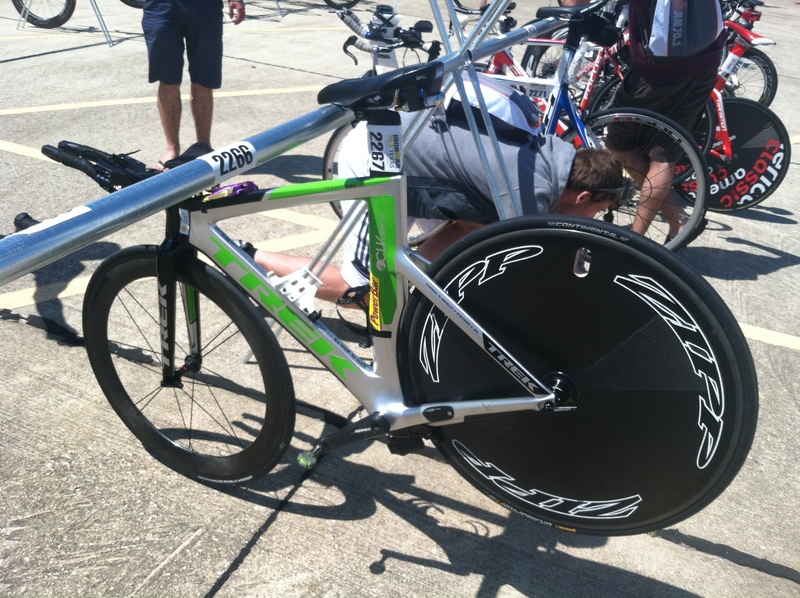 The first half of the bike we had an ever so slight tail wind which gave me a 65 minute split over the first 28 miles. The course is a pure out and back and since the wind was a crosswind the way back was pretty much the same as the way out, just a slightly slower. I was able to bring my power back up over the final 15-20 miles and came off the bike with a 2:13, covering the final 28 miles 1 minute slower than on the way out. Funny story here is that as I jumped off my bike in transition my bike shoe which was hanging out to my pedal (I do a flying dismount) went flying off. I considered picking it up for a nano second but decided the 15 seconds it would take to go back and get it were just not worth it. So with the crowd yelling “you lost your shoe” I simply responded with “it’s cool, I don’t need it any more”…it was time to run. The bike racked and ready. Thanks to Towpath Bike in Rochester, NY for coming through with the new Super 9 Carbon Clincher just in the nick of time. Rode smooth and fast! After losing close to a minute because I once again struggled to find my transition spot among the sea of similar looking racks I began the run. The first 3 miles felt like one of the transition runs after a 7 hour bike ride. I felt. Little blocked and couldn’t get the legs moving as fast as I wanted them. With my HR strap rendered useless (on the bike too) I ran by feel and over the final 2 loops I began to open up a bit and feel good. This good feeling was not only because of my legs speeding up but because of the tremendous on course support from the crowd. The 3 loop course is great for crowd support and horrible on your feet with all the turns. However, the fact that my friends/teammates were both racing and spectating at this point really gave me some great motivation. Seeing my teammates go by at different segments was great and having Tim Snow and his posse at a strategic point really made me want to run as fast as I could around the loop so I could get back to where they were. I knew where the motivational spots were and used those to my advantage. I ran the last loop with a bit more “juice”…I passed the boss’s wife Chrissie who cheered for me during every loop just before the finish line and sprinted in for the finish. I am proud of my race and very thankful to have the support of my family, friends, my QT2 family and all other supporters who allow me to do what I am doing right now. It is gratifying to have a race on a single day provide validation for the efforts made on the many many previous ones. On this day my efforts were worth a 23rd place overall and 4th place in my age group. It’s a funny thing that last year I finished 1st in the same age group with a time that was 11 minutes slower. That’s just how it goes, this year the heavy hitters showed up, and truthfully I wouldn’t have it any other way. I want my efforts to be stacked up against the best so I truly know where I am at. So for this race , 4th amateur is just fine with me and more gratifying than last year. It was a race that has given me added confidence in my training and continues the progression towards IMLP in July and beyond. Thanks to all our sponsors on the QT2 Systems Team. Pearl Izumi for the great new race kits, Normatec for an amazing recovery system, and Dr. Sears for the essential Fish Oil which keeps my body inflammation free. I also have to personally thank Chris Boudreaux and the great team at Athletes Lounge in Portland as they always take care of me, theres nothing better than being decked out in some A Lounge gear…Chris knows what he is doing. So if your ever in Portland, OR stop in the shop and check ’em out. And finally a big thanks to Jamie and Scott at Towpath Bike in Rochester as they keep me riding on great equipment and have been with me from Day 1 when I was a complete newb. 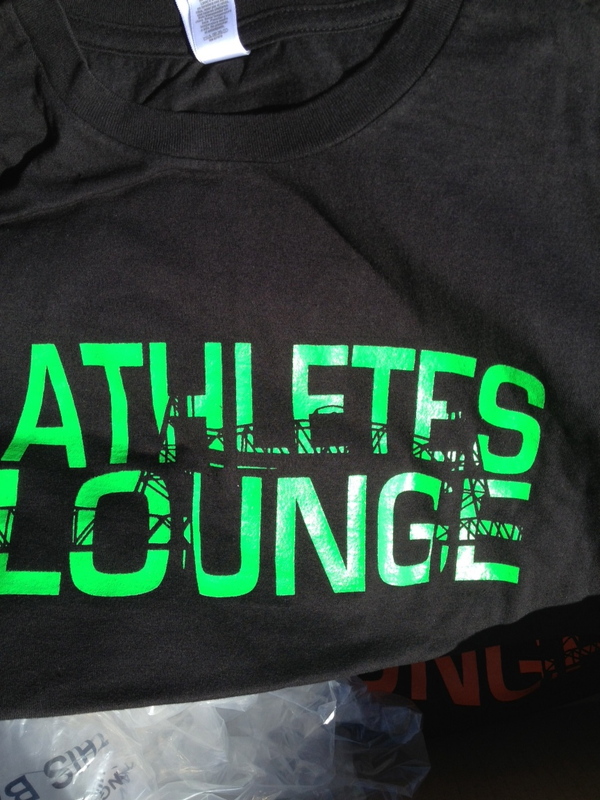 My Custom Athletes Lounge t-shirt in “Turbeau Green”. Thanks Guys! This trip was just what I needed on many levels. It doesn’t get much better than playing triathlon with your buddies in sunny warm weather.